Remco’s Warlord Toys: Plays Well With Others.. They say imitation is the sincerest form of flattery..and here is a great example. Action figures were always a passion of mine and I still maintain 90 percent of my collection to this day. 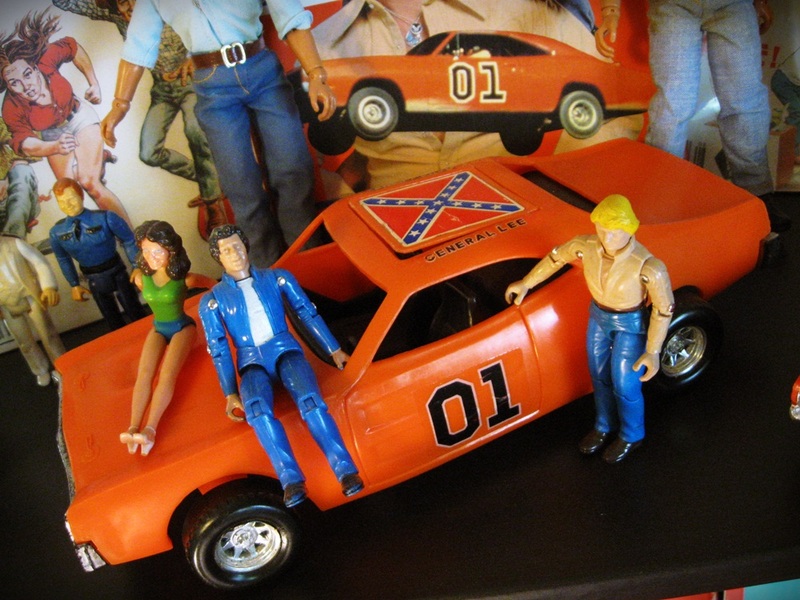 I have fond memories of pretty well every toy I ever owned. It fascinates me when I see toy lines from my collection era that I may have missed out on or simply never had the opportunity to buy. As is the case with our topic today. Comic book ads always spoke volumes to me..I wanted everything that were ever featured in the confines of my 24 page treasures. I knew many things featured in my comics such as Twinkies and Slurpee’s were sold only in the USA at that time and I had made peace with that. During my infrequent trips across the border from my home in Canada into the U.S. I would always make a point of hunting down things I could not get at home. I was always pretty successful..however from time to time there was always that one nugget that escaped my grasp…as was the case with Remco Toys. Founded in the 1940s, Remco Industries, Inc. was a toy company best known at the time for toys of the late 1950s and 1960s, like the Johnny Reb Cannon, Mighty Matilda Atomic Aircraft Carrier. “Every Boy Wants a Remco Toy…And So Do Girls!” screamed the Remco mission statement! 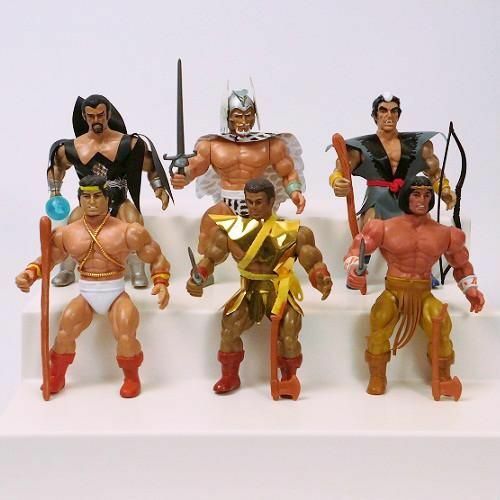 Their time on top of the toy world was short-lived and by the early 1980s Remco was fighting to find their niche in the lucrative Action Figure Boom of the 1980s. Franchises like Masters Of The Universe, Super Powers, Star Wars, GI Joe, and WWF Wrestlers were big hits on the Toys shelves. 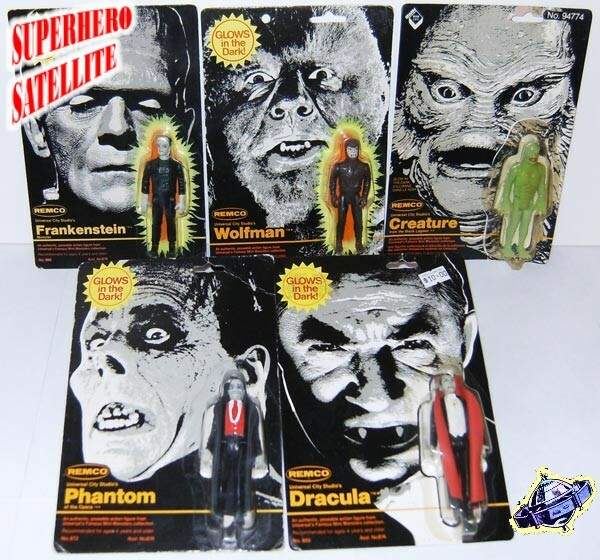 Remco entered the lucrative toy market with a thud in 1980 with their line of Universal Monsters Figures. Using a license they picked up in their formative years, Remco tried to strike with recognizable Movie Monster toys. The toys were decent, poorly articulated but a collector’s item now in the 2000’s and yes I had some and in their prime these were pretty darn cool! In 1982 Sgt. 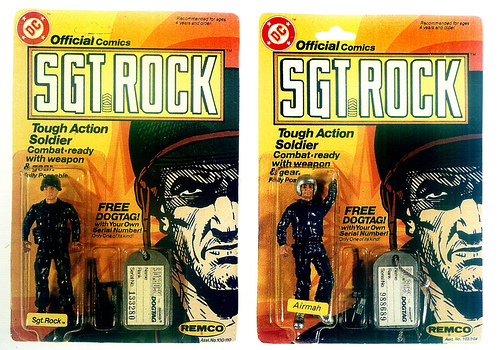 Rock figures for DC comics were released from Remco. I was a long time DC comics fan and loved Sgt. Rock comics but I did not have the good fortune to even see any of these figures. I had only seen them in ads in my favorite DC Comic books and I wanted them!! Sadly not one of these ever made it in my collection. I would have loved to have a Sarge figure run a campaign against Cobra with my Joe’s back in the early 80s! Then came the Warlord collection in 1982. 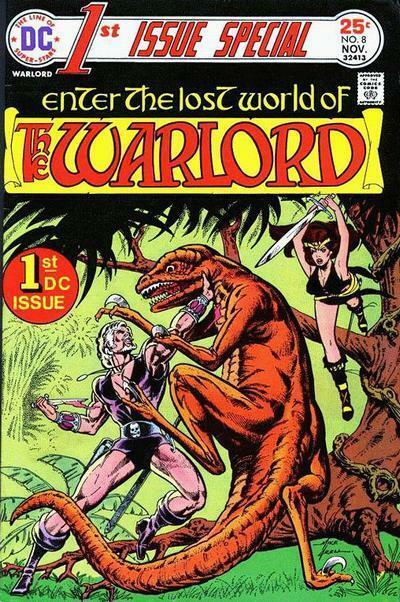 Even though I maintained several Warlord Comics in my collection I was never a fan of the character or the title. 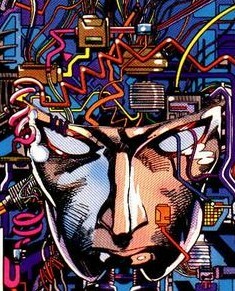 I WAS however a fan of the art work, and the damn cool look of the character. Like the Sarge..his collection of action figures did not grace the shelves of my local Woolco, Chain Store or even Dalfens Mall. 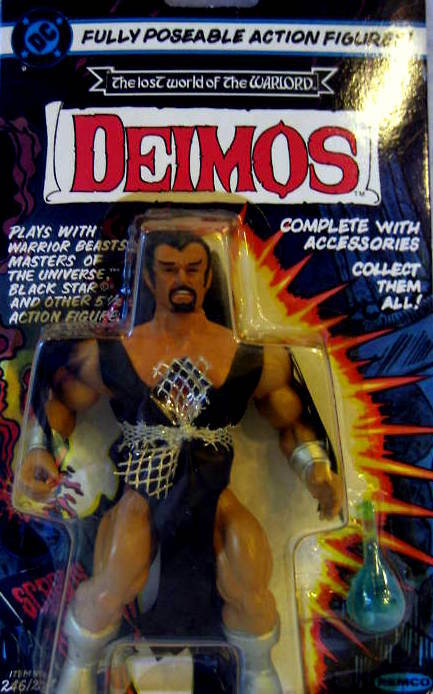 My home town obviously did not partner well with Remco. The above ad always caught my attention and it was only with the advent of the interwebs was this toy hunter able to finally see what these real figures looked like outside of the carefully drawn versions from the comic print ad. 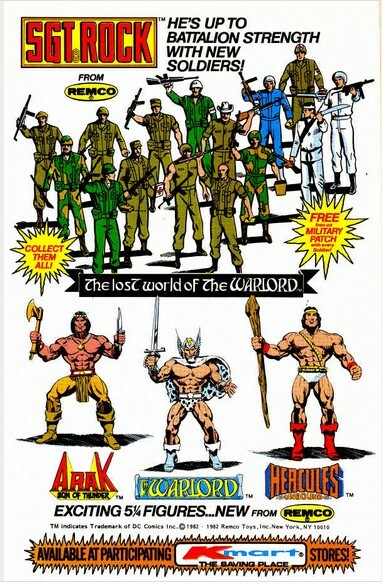 Several of the characters from The Warlord comics became action figures in Remco’s action figure line called “Lost World of The Warlord” . The line included figures like The Warlord himself (Travis Morgan) along with other DC Alum like Arak, Hercules (DC’s Version not to be confused with Marvels Avenger), Deimos, Machiste, and Mikola Rostov. 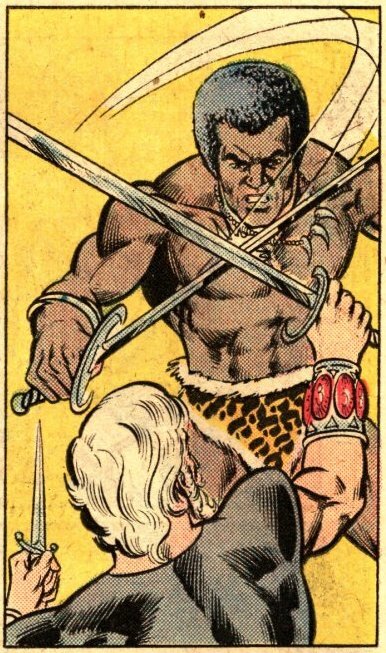 For those of us who have no idea who or what the hell this Warlord character is..here is your ten second catch up..Warlord first appeared in a series by DC Comics called 1st Issue Special Issue (#8 To be exact!) in November of 1975. 1st Issue Special was unique as it gave the comic buying world a chance to see new characters in their own solo comic without the risk of making a solo series. Basically it was their audition to the grand stage..or the spinner rack for that matter. Warlord graduated to his own book the following year as Warlord #1 debuted and went on to a very nice 133 issue run ending in 1988! Warlord was born in a 1970s worlds previously envisioned by the likes of Edgar Rice Buroughs (Tarzan) and Robert E Howard (Conan The Barbarian), and the visionary work of the legendary Frank Frazzetta. 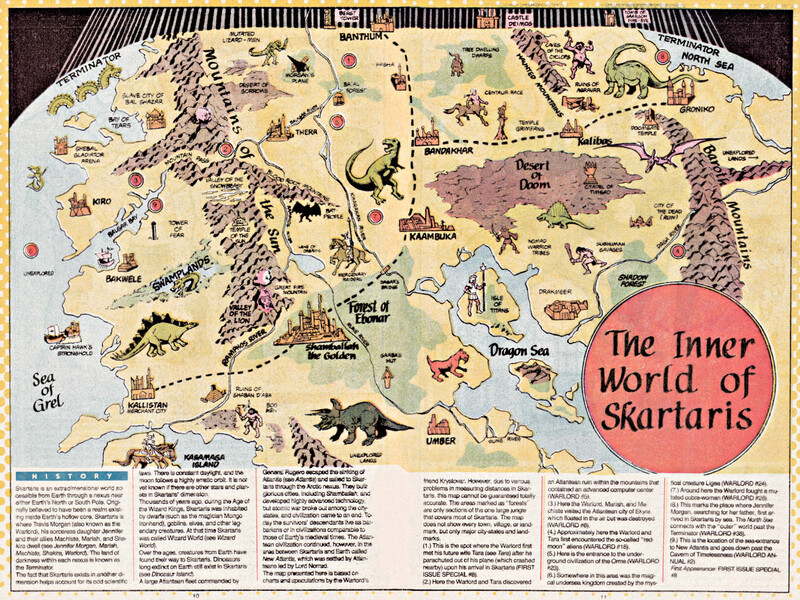 All three creators influenced the birth of the Warlord character as they wrote and illustrated a genre of savage lands and worlds filled with sword and sorcery as the world knew it in the 1970s. Warlord was not your typical barbarian..this character had something special about him.. The Warlord was a character named Travis Morgan who was a Vietnam veteran airplane pilot who inadvertently steers his plane through the Earths crust to a brand new Lost World thus beginning the saga of the Warlord. It bears mentioning long time Green Arrow artist Mike Grell was the writer/artist who created the Warlord character taking the artistic reigns through issue #52 (1982) and ending his writing duties with issue #71 (1983) giving him his definitive look. Usually clad in some form of white grab and his winged war helmet Warlord didn’t play games…this war vet wasnt afraid of this Lost World as he packed a special weapon..not a typical sword..but a .44 Automag Pistol! As Warlord navigates this new Savage land he is joined by the ever scantily clad Tara, Machiste, Shakira (Not the singer!) Mariah a handy scientist and years later his daughter Jennifer Morgan. Warlord and Friends via Cosplayers! Hercules?? 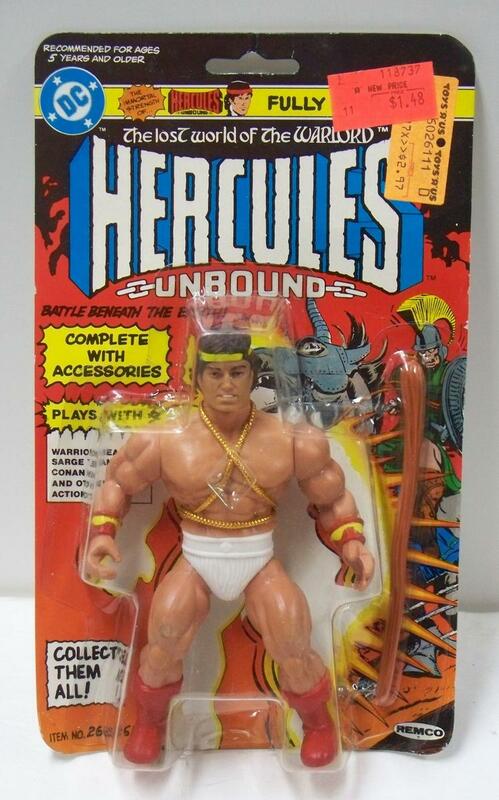 The Hercules figure is based on the Hercules Unbound Comics title by DC in 1975 created by Gerry Conway. Like many things produced in that time he exists in a Post Apocalyptic world like many in the Jack Kirby era. This version of Hercules somewhat tied into the existing Kirby title Kamandi. Unlike Marvels version of the classic Hercules with the beard and brown short hair DC went with a more unique version of the character with long black hair and a notably absent beard! 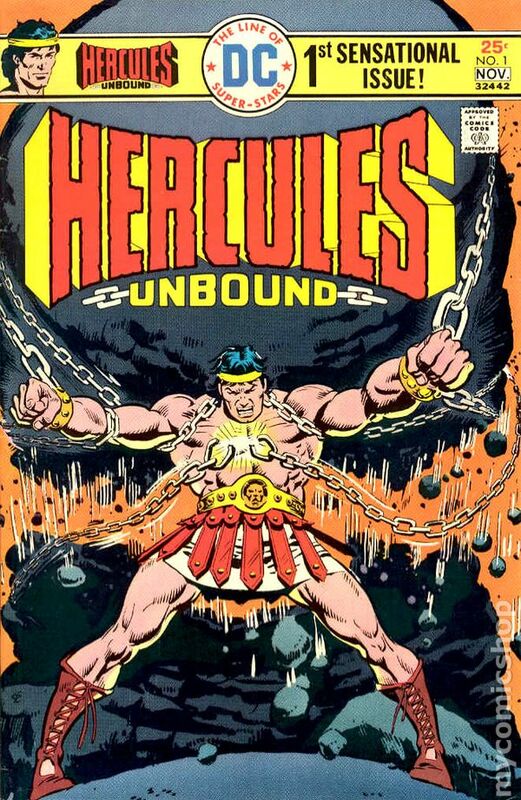 I always wondered where this character came from and was not familiar with the Hercules Unbound title. Looking back the title was short-lived lasting only 12 issues but an interesting fact is that it contained early works of Walt Simonson and one of my personal DC favorites Jose Luis Garcia Lopez! Apparently this character was not popular with the DC upper brass after failing to garner an audience. This version of Hercules was erased from DC History when it was discovered his existence was merely a dream.However the mess that is the DC Multiverse actually later changed that concept again bringing the character back…only to be annihilated in Crisis On Infinite Earths..Poor DC Hercules!! 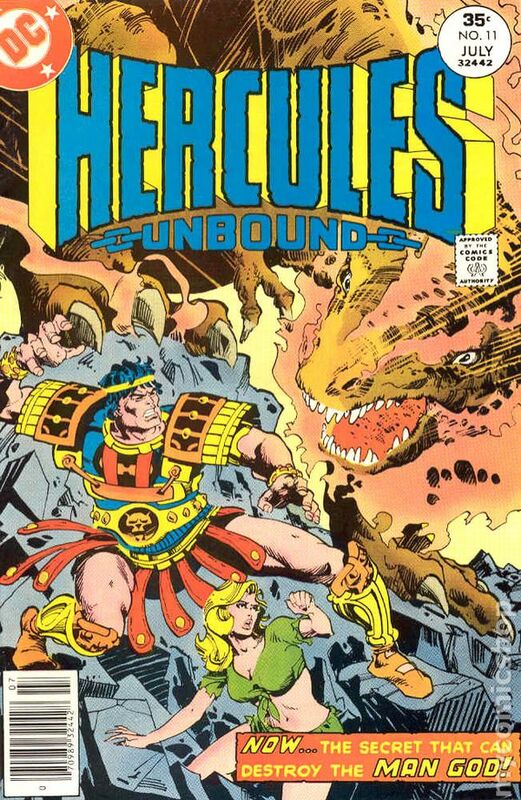 As with everything DC, Hercules would AGAIN be brought back again in another form during the insanely boring War Of The Gods crossover by John Byrne and even the classic armor from the Unbound series made its return. Confused? Me too. Eitherway..Remco did release the above very cool Remco Action Figure ! 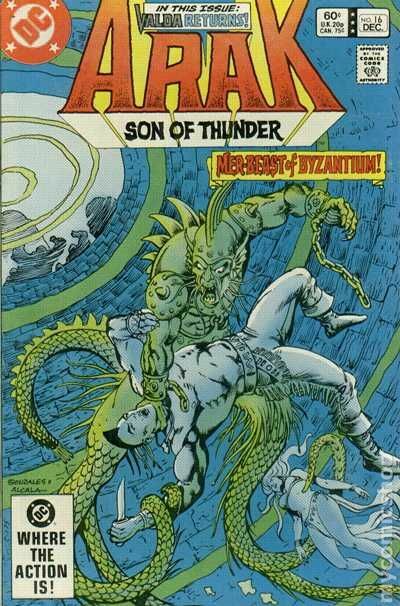 Something about Arak God Of Thunder always caught my eye!! Arak began as a not so subtle nod to Conan the Barbarian. The spin on this character was that he was a Native American hero unlike stereotypical versions seen during the time (I am talking to YOU Apache Chief!!) He was intelligent, did not speak in broken english and was a true badass! Araks first appeared in the pages of Warlord #48 as a special insert comic, as was the rage by DC during this time! Remember kids Teen Titans, Night Force and Captain Carrot all came out of these free inserts so these were awesome!! 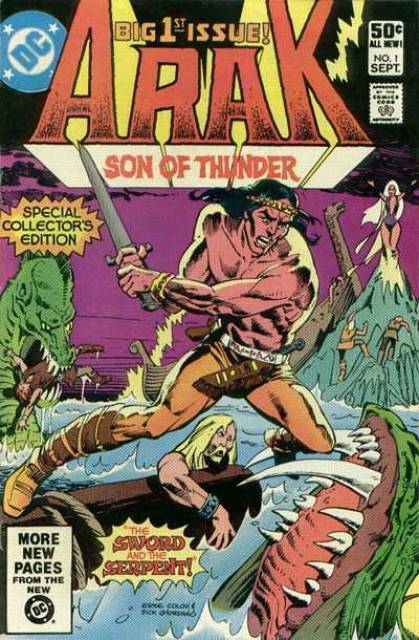 Arak debuted in his own Roy Thomas written title Arak The Son Of Thunder in Sept. 1981 and went on to a classic 50 issue run with DC! The figure showcased above his debut comic shows off their blatant attempt to create a Conan knock off. This look did not last long in the comics and Arak undertook a massive visual change adopting a more traditional Native American stereotypical fringed garb and hair style. Not sure what brought this on but something tells me his likeness was uncomfortably too close to Marvels Conan that other factors may have pressured this change. I’ll have to ask Roy Thomas on that one!! Many fans may ask..”Hero, who in the blue hell is Arak..and why should I care” Well here is your ten second catch history lesson! Stay with me on this or just skip to the next paragraph. 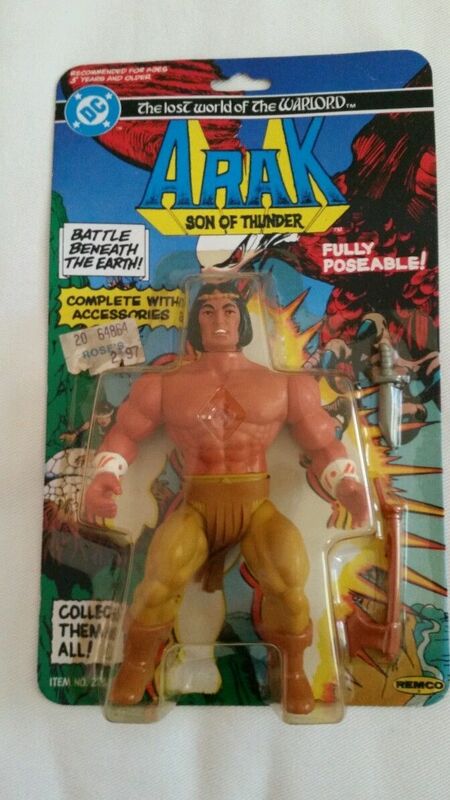 Arak was the Son of He-No The Thunder God. He took over his fathers mantel after his father was killed in a battle with a Serpent God. He realized that a young Arak was in mortal danger and saved him from harm, a move that ended up eventually killing Arak’s father. He-No had arranged for Arak to be sent out into the waters in a canoe away from the deadly reaches of his enemies. He is later discovered and adopted by Vikings who raise him to adulthood and teaching him all the Viking Battle techniques! Arak now in adulthood, goes on many “Conan” like adventures early in the run of the title but the a creative shift brought about many more science fiction elements like adventures involving demons, serpents, Gods and even Time Travel. 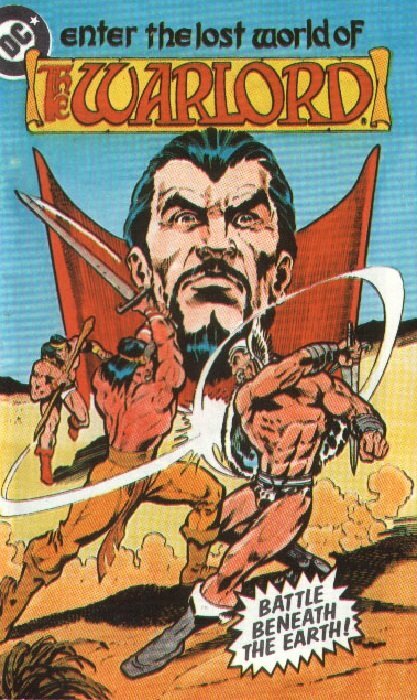 One curious thing about both Hercules and Arak was that both characters did NOT appear in the pages of Warlord. So their inclusion in the Warlord action figure line was curious or tells us how little character depth there was in the Warlord franchise that was actually marketable. Remco was not reinventing the wheel with the Warlord collection. This was a very real attempt to cash in on Matells success of He-Man and Company. The character molds were used multiple times after that with other Remco sets. Machiste was another one of Warlord companions..the only one of two of his legit comrades from the Warlord Comic Book Series! I still find it very strange they populated this toy line with only 50% actual Warlord related toys? Either way Machiste met the Warlord as both met were held captive on a Slave ship. Both men fought their way to freedom and from then on Machiste was by The Warlord’s side defending Skartaris from the Evils of Deimos. It is unusual that Remco selected this look for the Machiste character as his look very early in his run as a character (He debuted in Warlord #2!) visual changed dramatically. Fans of Warlord know Machiste as “the guy with the Spike-ball hand”. I would have liked to see what the thought process at Remco creative that went into the character selections this line! This would be my guess for this one toy in the collection that still sits in a thousand cases in a Remco warehouse somewhere. I may be wrong. 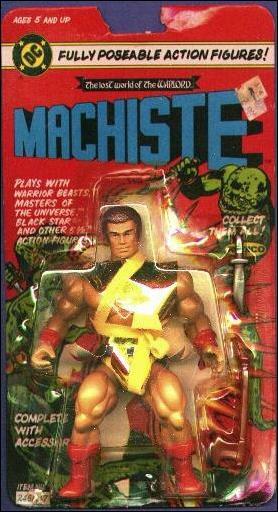 If you were a Machiste fan and had this toy..write a comment at the bottom of this page and I will retract that last statement. 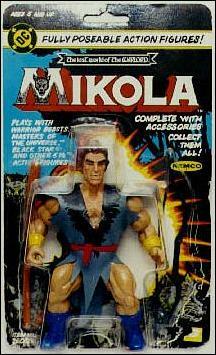 Moving on..
Then there is Mikola the second “Friend” Remco selected to play with the Warlord action figure line. Mikola Rostov is a handy swordsman who joins Warlord on his battles in the Lost Land but has a very unique ability…hes a Werewolf! His action figure already has him in his transformed state thankfully. The Warlord characters for the most part were not reissued with the exception of the Warlord himself who has at least two more (If not more!!) 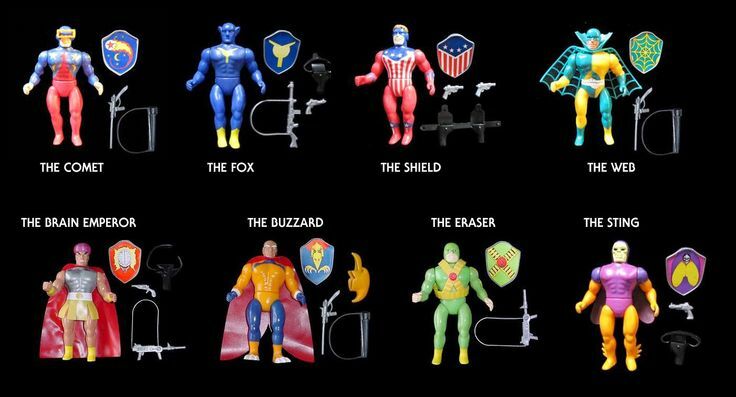 action figure incarnations and its no surprise. 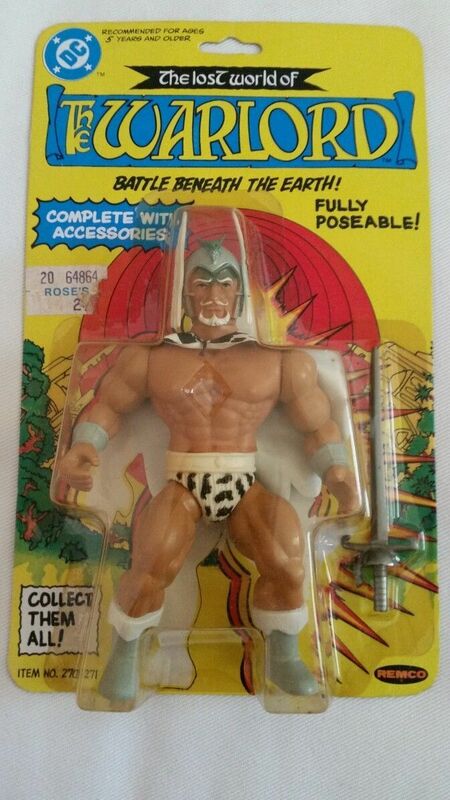 Bottom line the Warlord collection was a thinly veiled version of the Masters Of the Universe collection but it amazes me how little known and collected these were. REMCO wasnt done! Another spin off set figures (Free of DC License fees!! Smart move Remco!!) included.. set of Warrior Beast figures to “Play” with the Warlord collection. See if you can pick out a Skeletor and Beast Man knock off in that mix? The others in the set look like someone raided the Dollar store and glued random Dinosaur heads on He-Man bodies. One point here includes the fact that the same molds used for Warlord and The Wrestling Toys were re-purposed again here! Gecko, Snake-man, Craven, Skull Man, Skull Face, Wolf Warrior, and Hydraz. The funny thing about these toys is that a couple of these even made it to the real lost world of the toy shelves in my home town!! Especially the Skull guy. Take notice on the photo above of the Warrior beasts the infamous Skull-Man is on the bottom left..but on the bottom right is Skull Face!! Yes they used the exact SAME FIGURE AND PUT A NEW HEAD on the mold!! 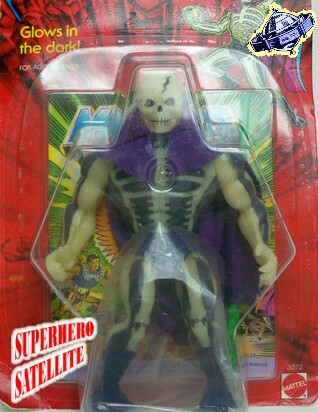 The Skull Face figure is a direct no bones rip off of Skeletor complete with hood and all. Remco must have been happy that Mattel didnt consider them active competition. “Hey..This guy looks just like SKULL FACE…” Said Nobody. Someone at Mattel I think had a funny bone as a very Remco like toy was released in the Masters line at the end of its tenure..I present Scare Glow…hmmmm…lol.Familiar? Scare Glow would definately “Play With” the Warrior Beasts line! Next Remco jumped the Shark from DC to their main competition Marvel Comics!! The result was as you would expect..lackluster.. I present Crystar: The Crystal Warrior.. 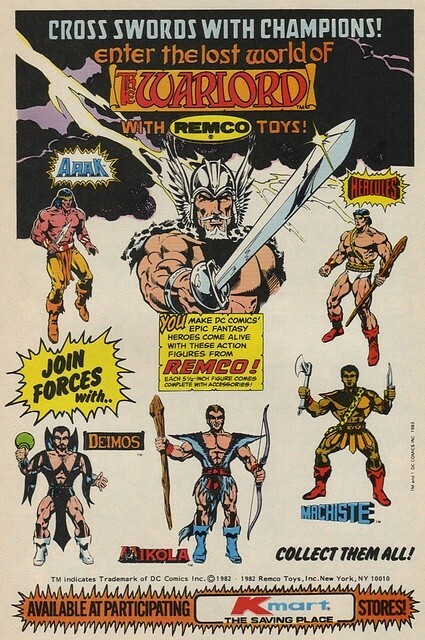 In 1982-83 Remco paired with Marvel to produce Crystar Action Figures. I was a fan of Marvels Crystar: Crystal Warrior Comic Series and I even remember picking up the guy at the far right with the pointy fingers!! I was so happy to find these toys at a discount store on a trip to a town an hour away from my home I didnt care that I didnt get Crystar!! This was an early attempt by Marvel to jump into the figure market through Remco! It was a dud as was the comic book series that is still fondly remembered but lasted a sad 11 issues. 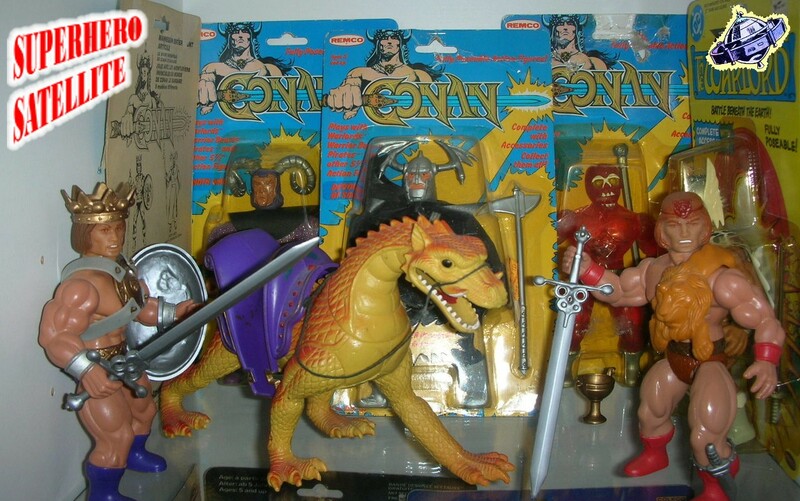 1984 brought Remco’s Conan Action Figure line. If you thought that the Warlord toys were almost too similar to the Masters Of The Universe Collection from Mattel the Conan series is possibly WORSE!! As a little bit of background He-Man himself was meant to be a Conan series as it was originally planned..however with licensing issues and deadlines Mattel went on to create a new property with He-Man and Company. Remco however looked at this flopped deal like printing money. Would this be Remco’s victorious first win in the Toy Market!!?? As fate would have it…No. 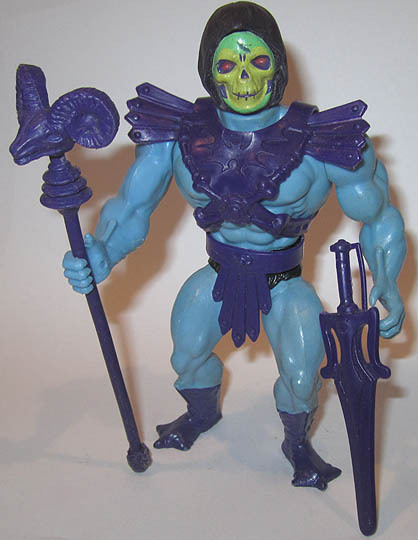 Apparently kids were more than happy with Masters Of The Universe and as a result Conan came off looking like a rip off despite the fact that He-Man was actually designed with Conan in mind!! 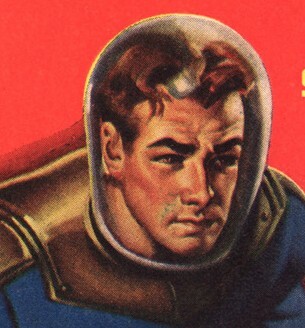 Did you know He-Mans original concept had black hair!! 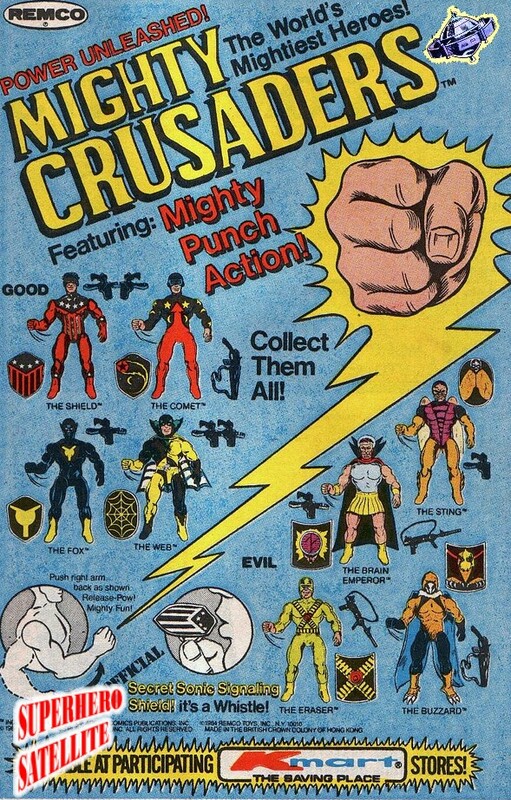 Remco not to be denied continued to try licensed toy properties this time partnering with Archie/Red Circle Comics to produce The Mighty Crusaders figure line!! I loved the comic book line by Archie mainly due to the fact that they were so rare to buy in my home town. A comic shop would sometimes yield a Crusaders title or two. Even during a scattered trade I would unearth a copy of the Fly..or The Web..or even The Shield!! These characters were cool and very under appreciated so I am glad to showcase the rare Remco figure collection below!! In 1985 Remco struck again! With the WWF and MTV partnering, Wrestling had become a very hot property! Wrestlemania had just been born and Hulkamania had exploded all over TV sets! 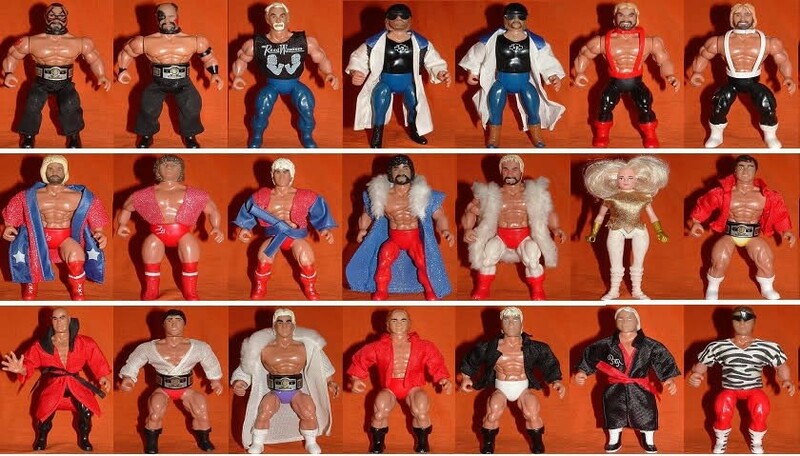 WWF and LJN had created their own Wrestling Superstars line of toys and were very successful. Remco wanted in on the action. They hooked up with prominent competition to the WWF, the American Wrestling Association (AWA) . The line boasted and remains popular to this day as it showcased early figures of the Road Warriors, Ric Flair, Shawn Micheals, The Freebirds, and Rick Martel. These figures are highly sought after by collectors and can generate a great deal of money in good condition.!! As well..the line used the molds for Warlord and Conan again! Remco got good mileage out of their early designs! Other great Remco toys included! 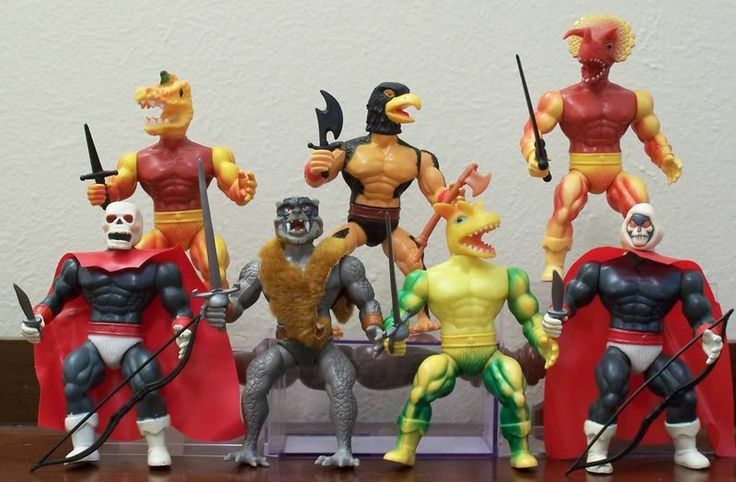 Everyone remembers the Masters Of The Universe Collection but some of those fans rarely remember the heroes from the Lost world. 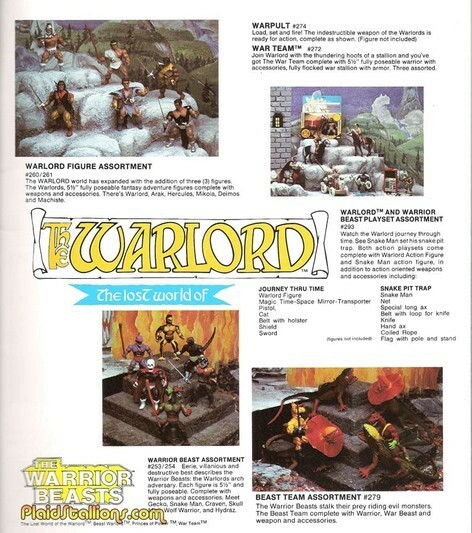 Warlord and his gang were indeed heavily “Inspired” by He-Man and friends and did not sell anywhere near the toys that Mattel did of the back of the mighty Eternian but its fun to look back at their biggest imitator! Not sure how flattered He-Man was with Warlord though? Heroes, back to the command deck we are about to lock in coordinates for our next stop…to a Galaxy far far Away..*Hint Hint* Dont forget Super-Blog Team Up Returns as well in December of this year with a theme that many readers of the Satellite will love. Take care..we will see you in another time..and place.